In a large skillet, heat the oil over medium heat. Once hot, but not smoking, stir in the onion and cook until it is soft and translucent, about 5 minutes. Add the garlic, stir, and cook until fragrant, about 1 minute. Stir in the chopped tomatoes and cook, stirring often, until completely cooked, softened and mashed-up and pasty looking, about 15 minutes. Lightly flour a rolling pin and roll out 1 thawed sheet of pastry about 1/8-inch thick to line the bottom and sides of a round baking dish (you may wish to add a pastry sheet in the bottom and top of the casserole, or only on the top!). Add the tuna filling to the puff pastry lined baking dish, using a rubber spatula to evenly spread the filling. Roll out another thawed sheet of pastry and use to cover the tuna filling – pinching the edges of the 2 sheets of pastry together to seal. Optional: In a small mixing bowl, beat the egg along with the water. Brush the top of the casserole with the egg wash.
Cut 4 to 5 vents on the top. Place the casserole in the oven and bake for about 20 minutes, until crisp, puffed up and golden brown. After watching your cooking show, my 8 year old insisted we make this dish together. I am usually not a fan of tuna or casseroles, but I have to say, this dish was amazing and will be added to our regular dinner rotation! Thanks for the inspiration to try something new! Awesome! I hope you and your 8-year old have lots more fun cooking together, Angie. OMG, Pati! My husband and I were a bit skeptical about a canned tuna pie, but we’d had success with so many of your recipes we decided to give it a chance. We were blown away – so delicious in so many ways! We started watching you in repeats on TLN in Canada last November and record you every time you are on. We love not only your recipes but also your insights into the culture of Mexico, which is inspiring us to take a trip in the not-to-distant future. And your boys are so cute and poised. Such a great show. THANK YOU! Thank you so much for tuning in on TLN, Maureen! I hope you have a wonderful trip to Mexico! I just made this for dinner!! I made the filling for empanadas and omg it was delicious, my husband loved it !! I’m so glad I found you! I’m from Durango,Mexico and I live in the USA and I miss Mexican food so bad and thanks to you I can made it and feel like I’m home!! Oh I’m so glad you found me too, Bri! Our oldest daughter lived and travelled Mexico for school for a month from Canada. We loved anything she made from there. Unfortunately she was tragically killed 3 days before our anniversary in August. She was very bubbly like you. Very crafty too! We now are going to celebrate Day of the Dead. My wife wants myself and our youngest daughter to go to Mexico to celebrate this year. Thanks for the amazing recipes! Celebrating the Day of the Dead is such a beautiful way to honor your daughter, Stephen. I hope your family gets to go to Mexico to celebrate this year. Sending you big hugs. I just made this. Thank you. I loved everything about it. Salt, Sweet, Heat. Amazing. Oh my goodness. I make this filling and put it in a sandwich (bolillo) and it is sooo delicious. Ten times better than any tuna salad you will ever taste! Thanks Pati! I made this tonight. It was wonderful. My daughter came over and I had her try a bite, she ended up eating 2 tortillas stuffed with the tuna. I would definitely make it again. I just recently found your show and I can’t begin to tell you how much I have enjoyed watching you and your family. You have a beautiful spirit. I have tried several of your recipes and they were all good. You introduced me to chipotle in adobe and I love it. Thanks for teaching us about Mexico, the people, the history and the food. Thank you so much Brenda! It is such an honor sharing my love of Mexican food, culture, and history with you guys. A great recipe, but it only serves 4 as a main dish. Can’t wait to try this recipe! Thank you, Pati! I absolutely love to watch you cook! If I make this ahead, would you recommend adding the pastry at the last minute before it is baked? Will it get soggy if I put a bottom layer of pasty in ahead? Love your enthusiam and cookbook. My husband calls Alisa pound cake 2 pound cake because it comes out so moist and delicious! Hi Sabrina, Thank you so much for getting my cookbook! I like to have the oven preheated before I assemble the casserole with the filling and the dough, so I can just pop it right in. The dough shouldn’t get soggy if you put some on the bottom. Hola, Pati – Me gusto mucho su programma. What port city did You say that Cazuela de Minilla de Atún originated in? Muchas Gracias! Veracruz! Muchas gracias por ver mi programa, Gus. Si, de nada, mi Amiga, es un placer. 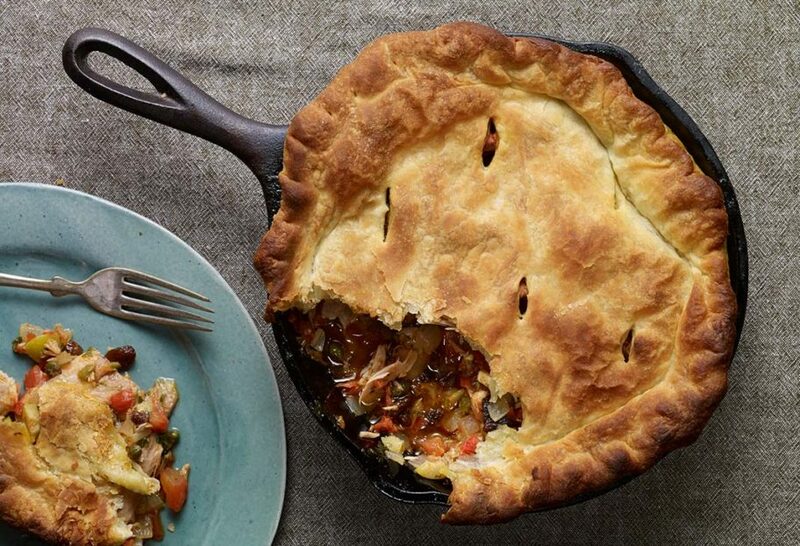 Do you know the name of the Le Creuset pan this dish was cooked in? I see both a 2 quart and a 3 quart tarte tatin dish on the Le Creuset website, but the dimensions of both seem smaller than the one used in this episode. Hola Matt, It’s the 2 quart tarte tatin dish. The tuna minilla casserole is my families favorite!!!! Thank you Pati, you are amazing 🙂 I love watching your show on monday. Can I use coconut oil instead of vegetable oil? When I was watching the episode, I thought Pati said to bake this for 20 minutes at 425F. Here, however, it says 25 to 30 minutes at 350F. Did I hear wrong? Will it work just as well to bake it a little faster at the higher temperature? Thanks. Will this fit in a deep dish pie plate, or should it be a round casserole dish? Am I supposed to cut the puff pastry to a round shape? Love your food Pati & you’re a delite to watch. Thanks Pat! Yes it would fit in a deep dish pie! It can be any shape you want, just leave enough dough to go a bit over the rim, for a nice crust.